A widow sobbed as she told a court how she held her dying husband's hand and told him she loved him after he was run over by car thieves. 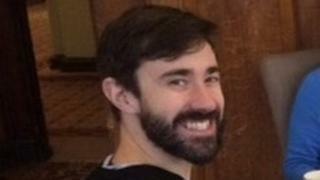 Mike Samwell, 35, had been woken in the early hours by a break-in at his home in Chorlton, Manchester, in April. The city's crown court was told he ran out of the house and when his wife followed she found him on his back with tyre marks on his chest. Ryan Gibbons, who denies murder, is accused of running over him twice. Mrs Samwell, who was allowed to give evidence from behind a screen in the witness box to minimise her distress, broke down in tears. In a police video interview played to the jury, Mrs Samwell said: "When I got to him, he had tyre marks across his chest. "There was blood coming out of the back of his head. He was making an awful noise. "I was shouting 'Help! Help! Somebody help me!'. Alistair Webster QC, prosecuting, told the court: "One of the rear wheels was actually on Mr Samwell's chest. He was screaming." Mr Webster said 29-year-old Mr Gibbons, despite his denial and claims he only felt a "bump", must have known he had driven over Mr Samwell. He said that audio captured by a CCTV camera near the scene recorded "a yelp, a shriek, a large crash, a small crash. Female screams, harsh engine acceleration and shouts for help". The court heard Mr Samwell, a nuclear engineer, suffered 39 separate external injuries, with "catastrophic" damage to his chest and heart. Mr Gibbons, of Steven Court, Chorlton, admits burglary and aggravated vehicle taking without consent, but denies murder and manslaughter. Co-accused Raymond Davies, 21, of Castlefield Walk, Manchester, also admitted a count of burglary but denies manslaughter and aggravated vehicle taking without consent. He is alleged to have transported Mr Gibbons to the scene of the crime and helped him escape afterwards. The jury was told police believe two other men were involved in the burglary but have never been traced. Stacey Hughes, 28, of Steven Court, Chorlton, is also on trial and denies a charge of assisting an offender.